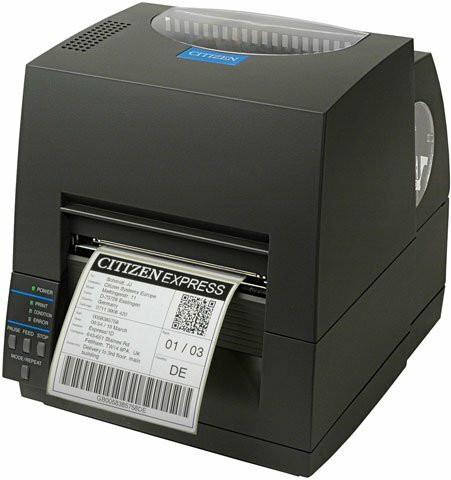 The Citizen CL-S621 provides users with unparalleled features in the desktop thermal printer class. With crisp 200 dpi printing for images or fine text and an unprecedented 360-meter ribbon for greater productivity and reduced downtime the CL-S621 is a high-performance printer built for the desktop environment. Citizen's unique metal Hi-Lift mechanism allows easy access for loading of media and/or ribbons and the adjustable media sensor can handle a wide variety of label configurations including standard and pediatric medical wristbands. The powerful on-board 32 Bit RISC processor delivers exceptional throughput and fast first label out. The CL-S621 comes standard with internal serial and USB interfaces. Optional Ethernet, Wi-Fi, and Parallel interfaces are also available. Two year warranty. CL-S621-GRY	 CL-S621, Direct thermal and thermal transfer printing, 203 dpi, 4.1" print width, 6"/sec DT and 4"/sec TT print speed, USB and RS-232 Serial interfaces. The Citizen CL-S621-GRY is also known as Citizen America	CIT-CL-S621-GRY	or CLS621GRY	.